The state of Washington is currently facing a devastating $5.8 billion revenue shortfall. In response to this financial crisis, lawmakers have created budget proposals containing deep cuts to the state’s Basic Health Plan, education, Disability Lifeline, and other social safety net programs. These cuts would disproportionately affect low-income, immigrant, and communities of color. The people who are not being asked to sacrifice? Big banks and out-of-state corporations. On Wednesday, April 6, Alliance for a Just Society affiliate Washington CAN! kicked off a week of budget protests in the state capitol of Olympia. 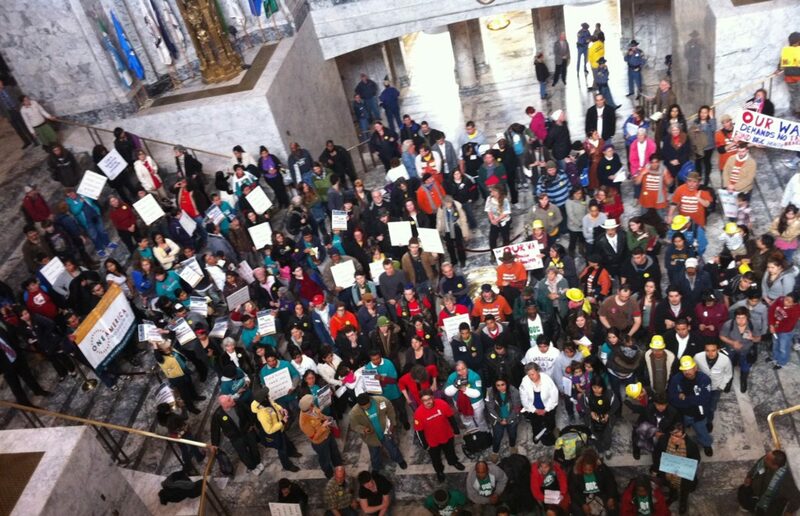 Over 600 people converged on the Capitol for a full-day of rallying and action. After rallying in the Capitol rotunda, protesters marched to the legislative building and disrupted a House Ways & Means hearing on a budget proposal from both the inside and outside. Inside the hearing room, thirty people entered the room wearing concealing t-shirts that spelled out the messages, “Nowhere left to go” and “Cut Tax Loopholes,” letter by letter. After they stood up and revealed their message, they chanted “Money for Health and Education, Not for Banks and Corporations!” until they were escorted out. A different group of t-shirt wearers did the same thing during a Senate session. The day culminated with everyone congregating in the Capitol rotunda, chanting and cheering for over an hour. For that period of time, the building truly did belong to the people. Then, 100 people unrolled their sleeping bags and declared that they would be spending the night. For months WA CAN! has been working to highlight the fact banks and out-of-state corporations are not paying their fair share of taxes in Washington (or, in some cases, any taxes at all). They’ve held direct actions at branches of Chase Bank, Wells Fargo, and Bank of America. They even traveled to Olympia in March to “quarantine” the state capitol from an infestation of lobbyists and contaminating lobbyist germs. For months, WA CAN! has been advocating for the closure of outdated tax loopholes that benefit banks, private jet owners, and cosmetic surgery patients, as a way to make revenue. Rather than relying entirely on cuts, they’ve said, let’s raise money from the people who actually have money to give. 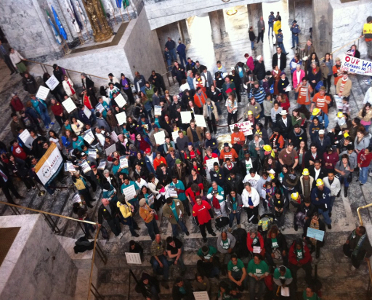 The day after the Capitol sleepover, 800 members from Service Employees International Union Local 1199 and 775 descended onto Olympia and again took over the capitol building. Members, representing mental health and home health care workers, disrupted both the House and Senate by sharing, and had to be physically removed from the chambers. Hundreds of people congregated outside of Governor Chris Gregoire’s office, chanting “We want the Governor!” In response, the Governor’s door was locked and fifteen state troopers were placed outside. The situation eventually led to 17 arrests, and a meeting between SEIU and the Governor. The following day, tension was down, but the number of people who came to Olympia skyrocketed. An estimated 10,000 workers representing the Washington State Labor Council and every imaginable union across Washington rallied on the Capitol steps, making it the largest labor protest in recent state history. The Week of Action garnered scores of positive local, as well as national coverage. Despite the widespread support of the Week of Action, days later both the House and Senate introduced all-cuts budget proposals without mention of closing corporate tax loopholes. In response, Washington CAN! quickly organized a People’s Walk For Our Future, which is currently the midst of happening. A group of community leaders are spending five days walking fifty miles from Seattle to Olympia to again urge legislators to crate a moral and just budget that funds human need, not corporate greed.